This is one of my favourite muesli recipes. It comes out of Marie Claire's cookbook Kitchen. It is simple and tasty, but poses the problem of it won't last long in this house. It is lovely and crisp, and marries perfectly with yoghurt, as a topping to stewed fruits, with ice-cream and of course the traditional way in a bowl with milk. 1 cup triticale (which is a cross of wheat and rye and can be found at health food shops, if you can't find it or don't want to use it just substitute with oats). Preheat oven to 150 degrees celsius. Mix all the dry ingredients together (excluding dried fruit). Heat the oil and honey together until well combined and toss through the dry ingredients making sure you coat everything. Bake for 30 minutes tossing occasionally until all the ingredients are lightly toasted. I find putting them in two baking dishes helps. Once cooled toss through the dried fruit and allow to cool completely before storing in an airtight container. Visiting from Our Delightful Home. I hadn't either, and thought it was a long shot, when I visited my local organic store I was surprised to see it there on the shelves. I think any good health store would carry it. Thanks heaps for stopping by! 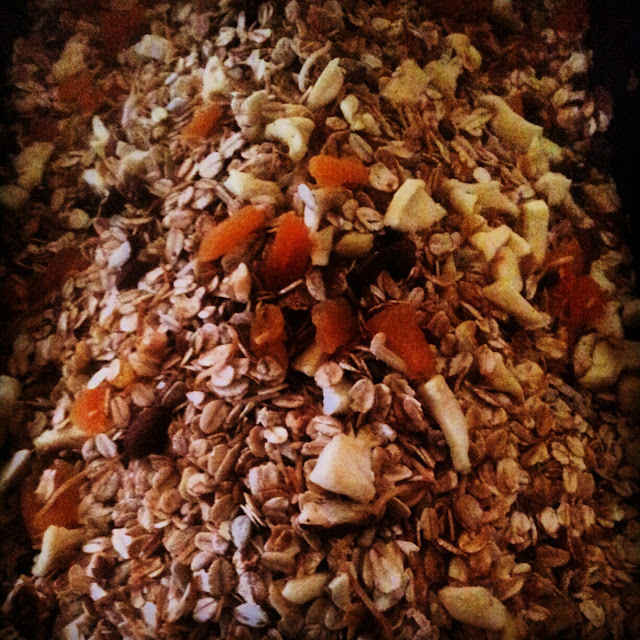 I fell in love with Muesli when we were in Germany and just love it still. Thank you so much for sharing your awesome recipe with Full Plate Thursday. Hope you are having a great weekend and come back soon! Mueseli is one of our favourites! Thanks heaps for stopping by!